The Church & Child Abuse-Resources & Info. To receive a sacrament, the child/youth needs to be baptized, the family registered at the parish, and faithfully attending the faith formation program. Archdiocesan policy requires that a child/youth have completed at least one full year of religious education prior to entering a sacramental program. 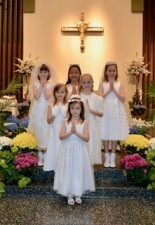 FIRST RECONCILIATION & FIRST EUCHARIST are usually received in second grade. There are parent meetings on the history and understanding of the theology of these particular sacraments. The parents are their child’s primary catechists and work with their child at home. A retreat day is scheduled for the child to review their understanding and prepare them for celebration of the Sacraments. CONFIRMATION youth are invited to prepare to receive Confirmation in the 9th grade. They should be actively involved in religious education during both the 8th and 9th grade as remote preparation. This program provides youth with an opportunity to deepen their personal relationship with Jesus Christ and to serve Him in the Church and the community. Their preparation consists of meeting in groups for Confirmation catechesis, participating in service work, meeting with a sponsor, attending a retreat, and having an interview with a parish priest or staff member. Please direct any questions about Confirmation to Letty Mason. Confirmation completes the grace of Baptism by a special outpouring of the gifts of the Holy Spirit, which equips the Catholic for active participation in the worship and life of the Church. Youth are invited to prepare to receive Confirmation in the 9th grade. They should be actively involved in religious education during both the 8th and 9th grade as remote preparation. For all Sacraments, please contact the Parish Office, 301-733-0410 ext. 4.